Improving on the world’s top-selling stage tuner, the Boss TU-2, the new TU-3 adds a smooth 21-segment LED meter with a High-Brightness mode that cuts through the harshest outdoor glare, pin-point accurate tuning all housed in a tough Boss stompbox body! The TU-3 has modes for guitarists and bass players as well as other electro-acoustic based folk instruments. A chromatic mode utilises the on-board LED's to get you 100% correct to your desired note. A flat-tuning mode can support up to six half-steps so that tuning 7-strung guitars and 6-string basses can also be done with ease. The Boss TU-3 Tuner pedal was designed to give you reliable operation night after night so it's built to deliver that without fail. So confident are Boss, that the TU-3 also comes with a 5-year warranty! A tuner should always be integrated into your guitar rig but when it's not in use, you don't want any additional noise tarnishing your performance. 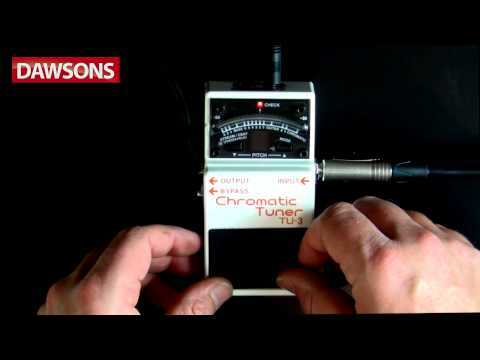 To this effects, the Boss TU-3 Tuner Pedal supports true-bypass for no noise, clicks or pops, simply tune up and get on with the gig. An electric or electro-acoustic player should always have a means to get solid tuning with ease and the Boss TU-3 Tuner Pedal will deliver that for many years without fail.